When we talk about apps, there are only some devices that have the capacity of utilizing the full features. One such device is the iPad. This device is equipped with an exceptional hardware framework that provides unparalleled experience to users. This is the only reason why iPad web development is high on demand and that too at unprecedented rates. The days when iPhone apps simply could be handed on to iPad screens are long gone. Perfection is the name of this game and hence, specialized apps for iPad are in demand. Axis Technolabs completely understands what users need when it comes to iPad app development. We are hence in a favorable position to deliver exactly what clients as well as users need. Our development is effective along with having a beautiful UI. Our team of iOS app developers does everything possible in pursuit of perfection with regards to iPad apps. Your need may be simple or complex; our team gets onto the requirement with thorough efforts and renders outstanding results. 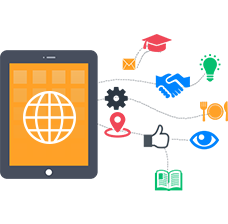 We boast of a complete understanding of iOS SDKs and know how to use these kits for development according to client and user needs. We leverage these tools to maximum effect and provide visually thrilling, functionally rich and ROI providing iPad apps. What to expect from Axis? So get in touch with our expert team with any requirement related to iPad web development.